Once you exit immigration (visa process explained in another post) you come to customs. 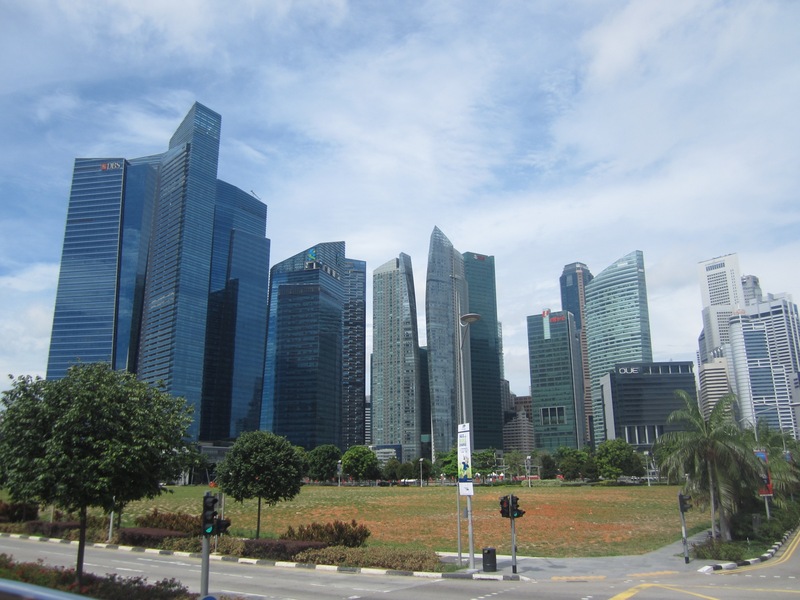 Unlike other countries where you simply walk out unless you have something to declare, in Singapore every bag is rescanned by a customs officer and they are VERY thorough. Be sure to check what you can and cannot bring into the country. We didn’t do that but we were lucky. Glenn had bought a knife in Nepal modeled after the traditional knives the military have. At customs they made him take it out of his backpack and they measured it to be sure it was allowed. We were so nervous that they might take it! Apparently you can only take knives into the country that are 10cm long. Glenn’s was right on the edge but they let us through. They also required me to take my Swiss Army knife out of my bag, but that was not a problem once they saw it. 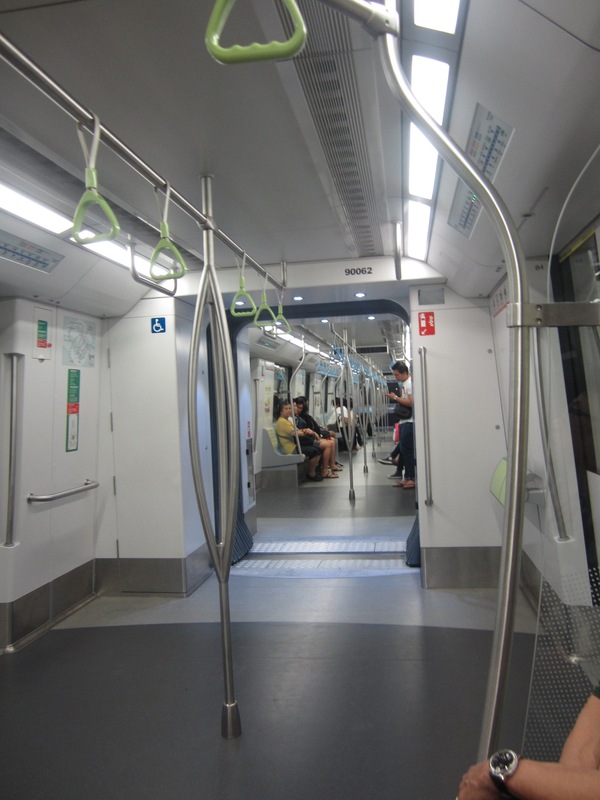 The metro in Singapore is excellent and goes right to the airport. I recommend booking a hotel within short walking distance of a metro station. That way you can save money by avoiding taking a taxi from the airport to your hotel and it makes it easier to get around the city. Metro into the city center takes about 30-45 minutes. We bought the 3-day tourist pass which worked great! 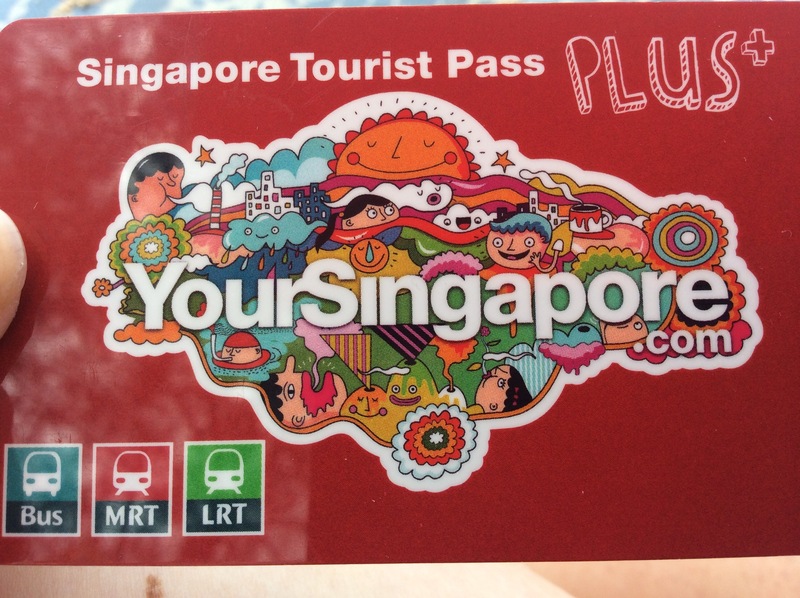 Use the metro as much as you want for 3 days – cost $30 (Singapore dollars) per person. This pass also included a hop on, hop off bus tour with the company FunVee and a boat tour on the river with the company Bubblejet. 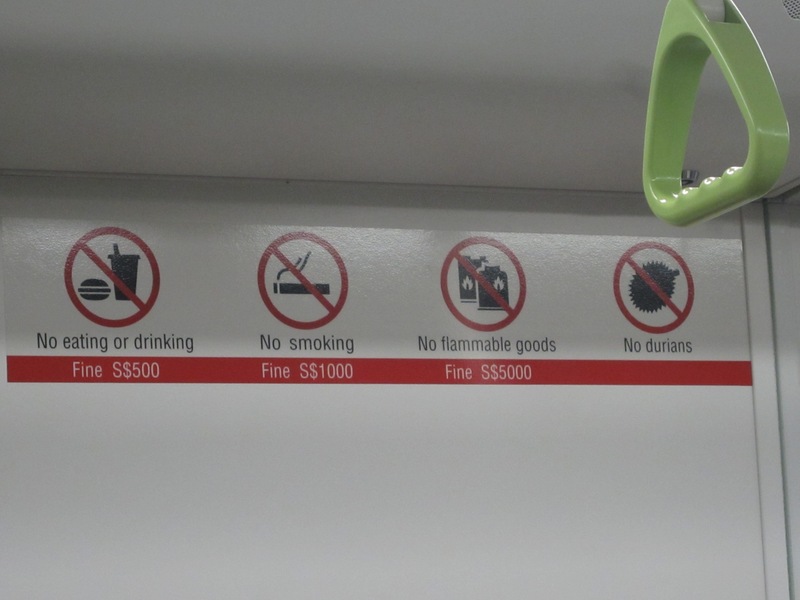 There are several rules on the metro. Be sure to follow them or you may face steep fines. 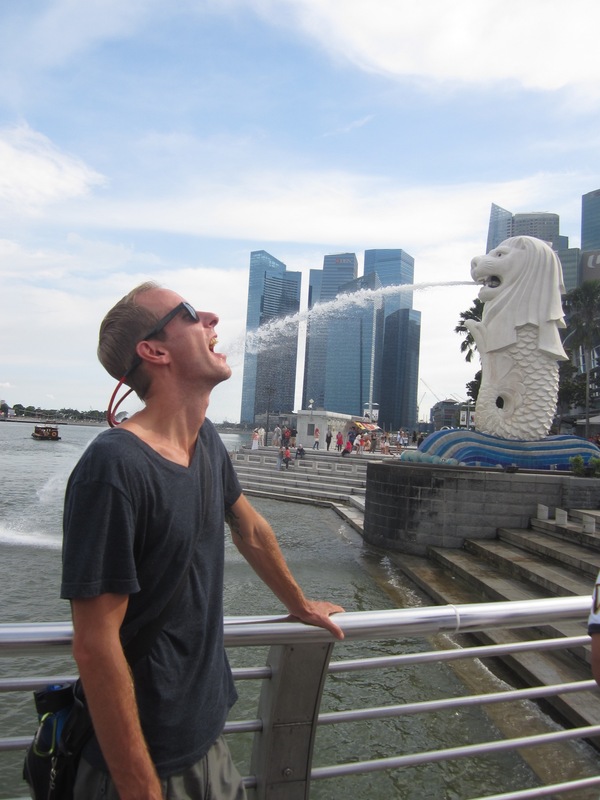 Hotels and hostels are VERY expensive in Singapore. We booked one called Hawaii Hostel. The owners were very sweet and really tried but it was incredibly basic and I do not recommend. They did have air conditioning and private rooms which was good. The location on the other hand was great. 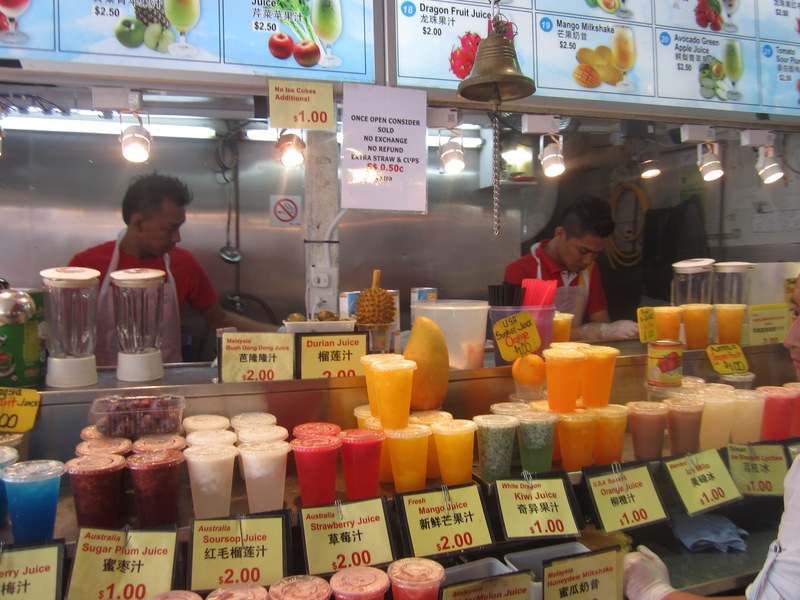 It was in the Bugis neighborhood, just a 10 minute walk to the Bugis Metro station and around the corner from Bugis street (a great area full of shopping and food vendors). 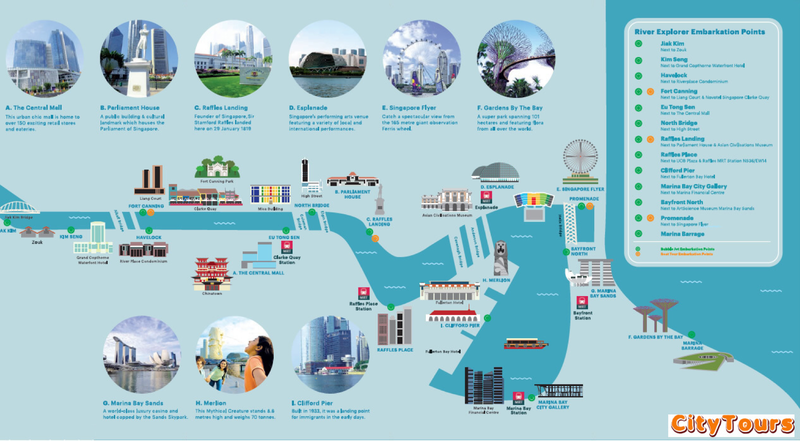 Bugis station is on the blue and green metro lines and is only 2 stops away from both Chinatown and Bayfront (Singapore Bay Area and Marina Bay Sands hotel). 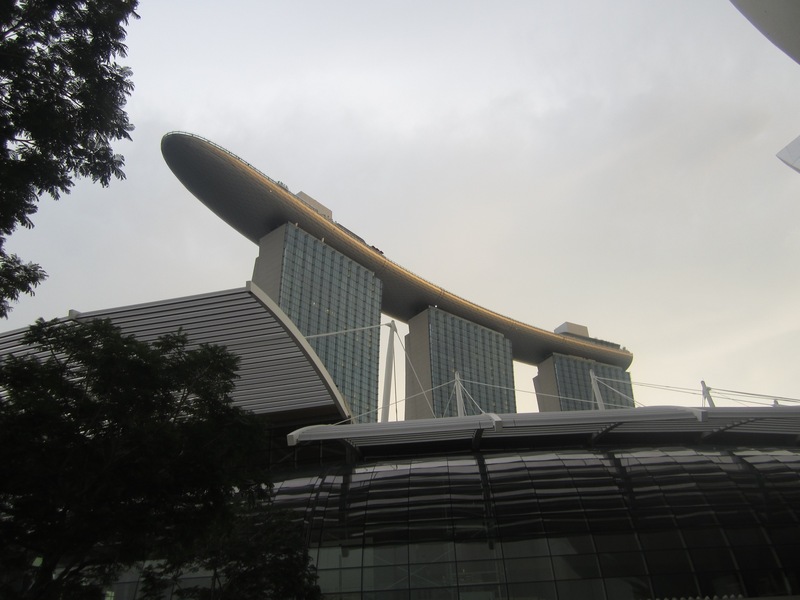 Singapore Bay is home to one of the world’s most famous hotels, the Marina Bay Sands. This hotel opened in 2010. It consists of 3 towers capped by what looks like a large ship. 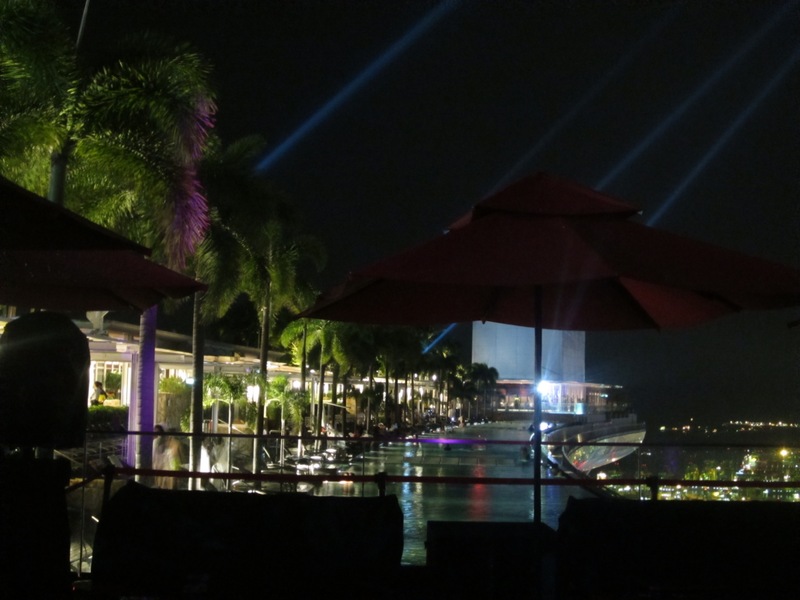 On the roof is a restaurant, 2 bars and the infinity pool they have become famous for. 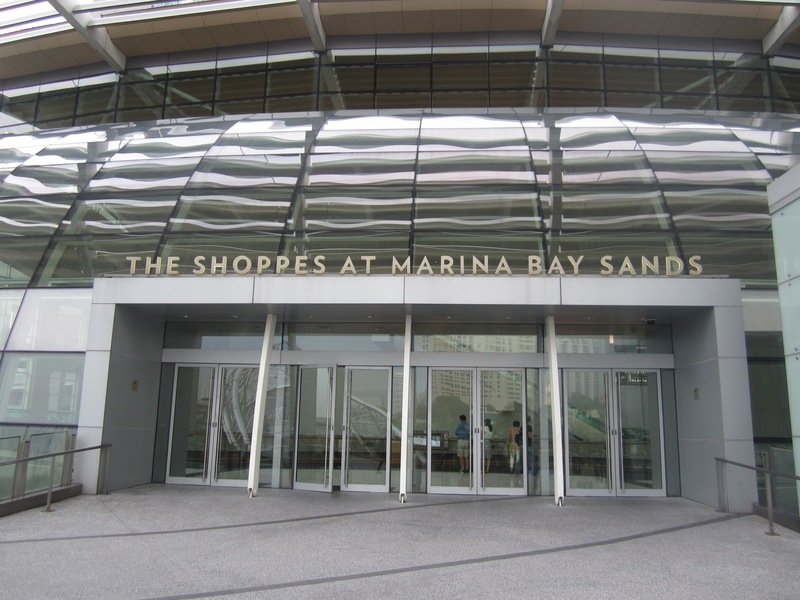 Below the hotel you will find the Shops at Marina Bay Sands. This is essentially a designer shopping mall. 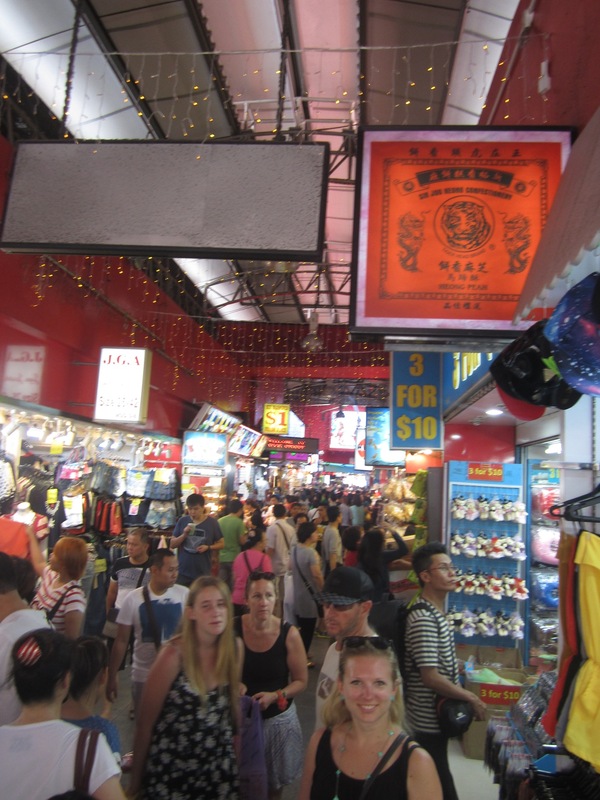 Very fun to walk around and window shop but not very practical for the average traveler. We did not spend much time here, really just passing through. 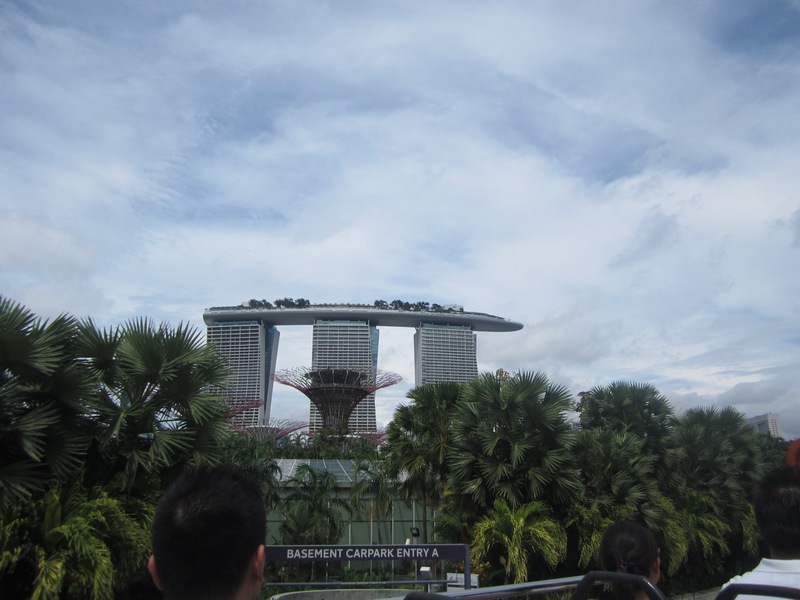 After walking around the Bay Area we headed over to Gardens By the Bay (just on the other side of the Marina Bay Sands hotel). 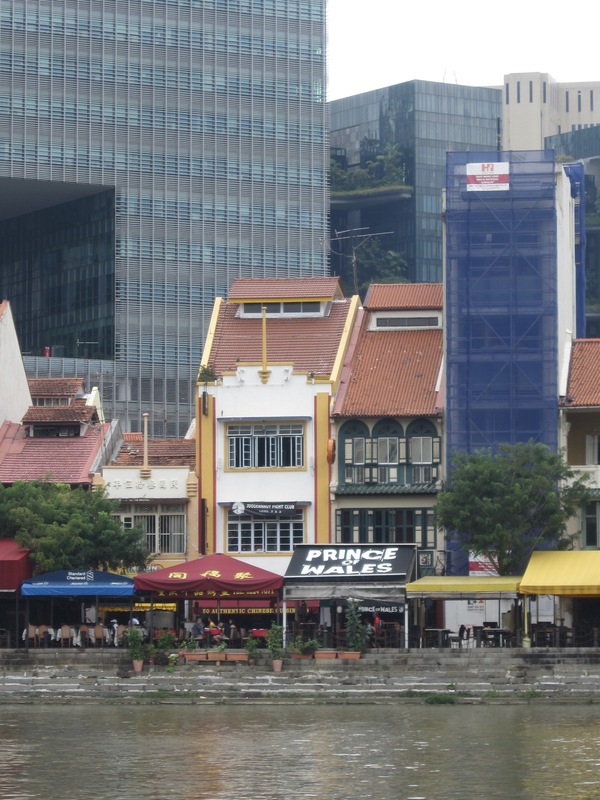 This area is a part of the citys plan to transform Singapore from a “Garden City” into a “City in a Garden”. It consists of a variety of gardens and conservatories, some of which require an entrance fee, but much of the area can be visited for FREE which I just love. Though of course this area can be visited during the day, night is when it is really magical. 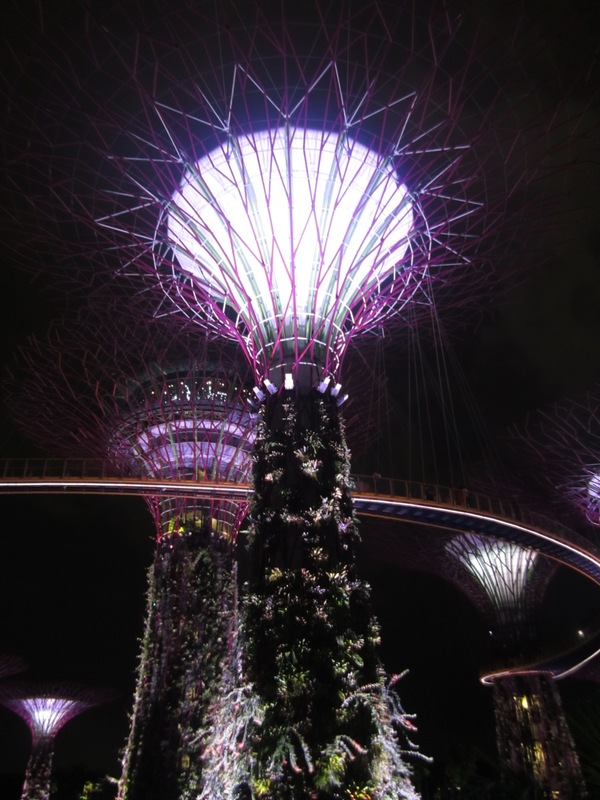 At the center of the gardens is the SuperTree Grove. 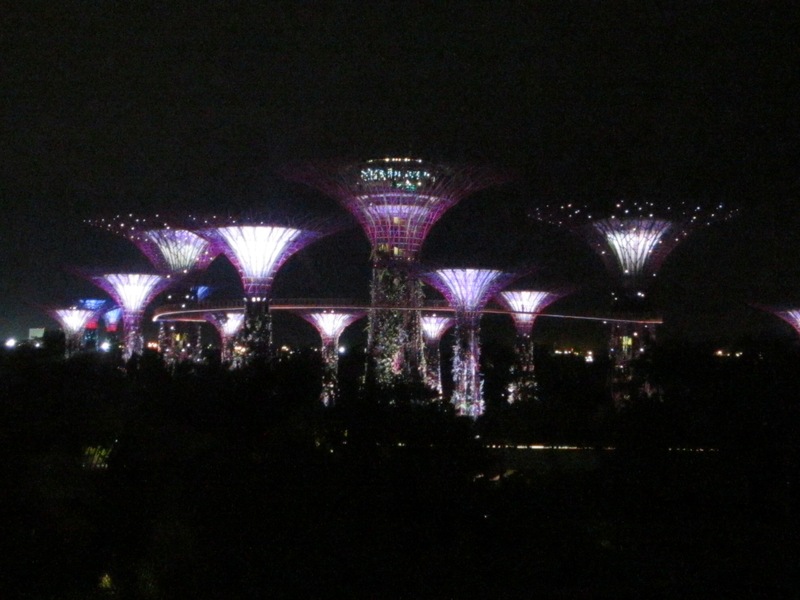 Every night at 19:45 and 20:45 these supertrees come to life in a beautiful light show reminiscent of the trees in the movie Avatar. 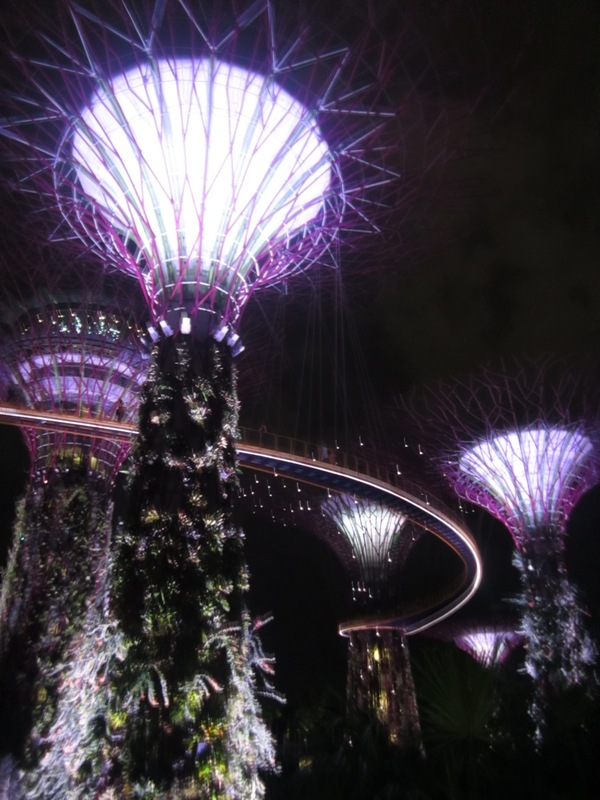 This light show is also set to music and is a perfect evening activity during your visit to Singapore. On our way back to our hostel our first night we passed a movie theatre about 2 blocks from our hostel. 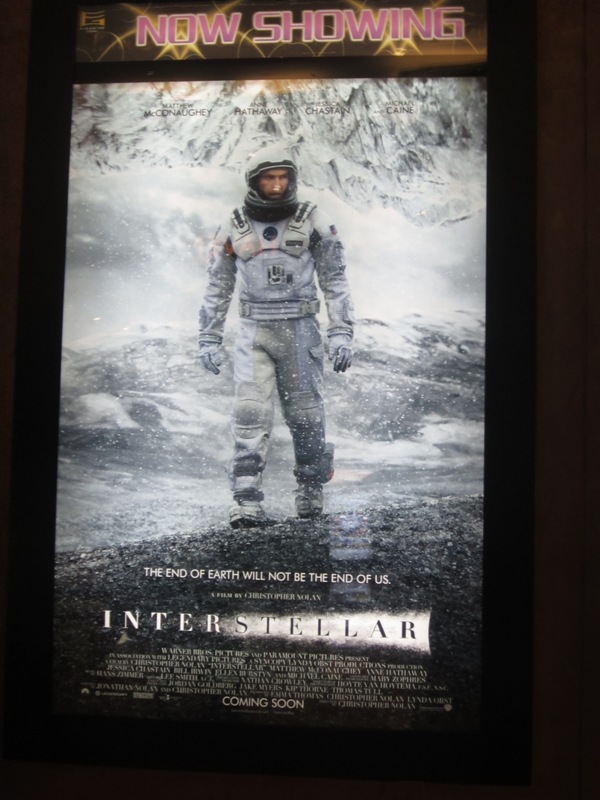 We went in to see the times for Interstellar (it had just come out and everyone was talking about how amazing it was). Luckily it was starting in 15 minutes! So we decided to grab some quick dinner at the theatre and went to a movie! This was not a cultural experience. The theatre was no different from those of America or Denmark. However, when you are traveling for long periods of time it is important to take breaks from traveling to just do something normal (like going to the movies). It helps you to maintain travel stamina and to just relax for a little while. And the movie was excellent! If you have not seen it, go see it now! 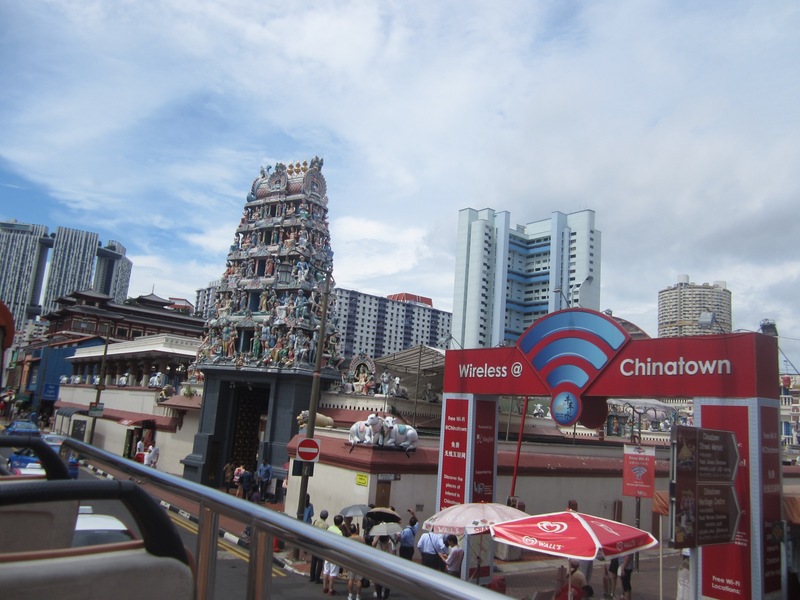 We started our second day in Singapore with the Funvee hop on hop off bus tour. I am not normally a fan of these tours because I think you miss experiencing a city when you see it from a bus and I think they are usually overprices (this one included). However, this tour is included for free with the 3 day tourist metro pass so we decided to do it. I have to say it was a lot of fun. 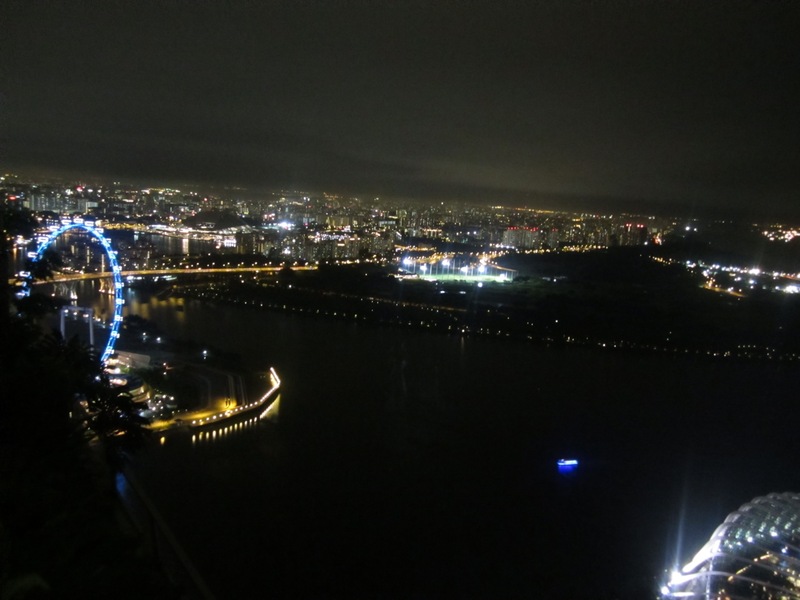 The full circle takes about 45 minutes and will take you past some of the major sights such as Chinatown, Marina Bay Sands Hotel, Singapore Flyer (currently the worlds largest ferris wheel), etc. The audio commentary was not great so we didn’t always know what we were looking at but it was a nice way to see the city for an hour. Definitely NOT worth buying the ticket for this but because it was free, it was a fun hour. I recommend taking advantage if you buy the 3 day metro pass. 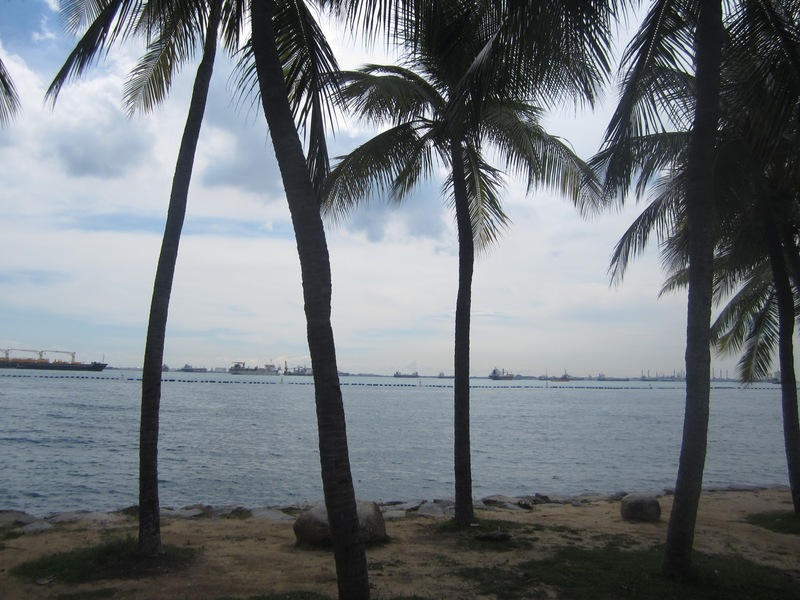 After our bus tour we decided to head down to the beach (Yes, Singapore has a beach). We didn’t know anything about it but most things we read said that the beach was free, it was hot in Singapore and we thought a free beach would be a nice inexpensive way to spend our day. What we found was better than we could have possibly imagined! Take the metro to Harbor Front station (at the end of the yellow and purple lines – only about 15 min from city center). You emerge in a huge shopping mall, VivoCity (nearly every metro station puts you in a shopping mall in Singapore). 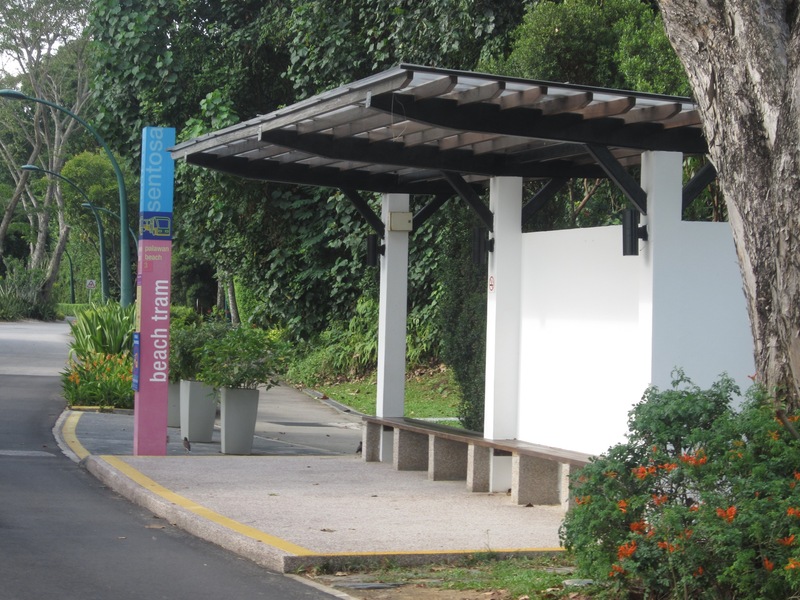 There are three ways to get to Sentosa from here. 1. Take the cable car. Looked really cool with great views but this costs $29 round trip which we felt was a bit expensive. 2. 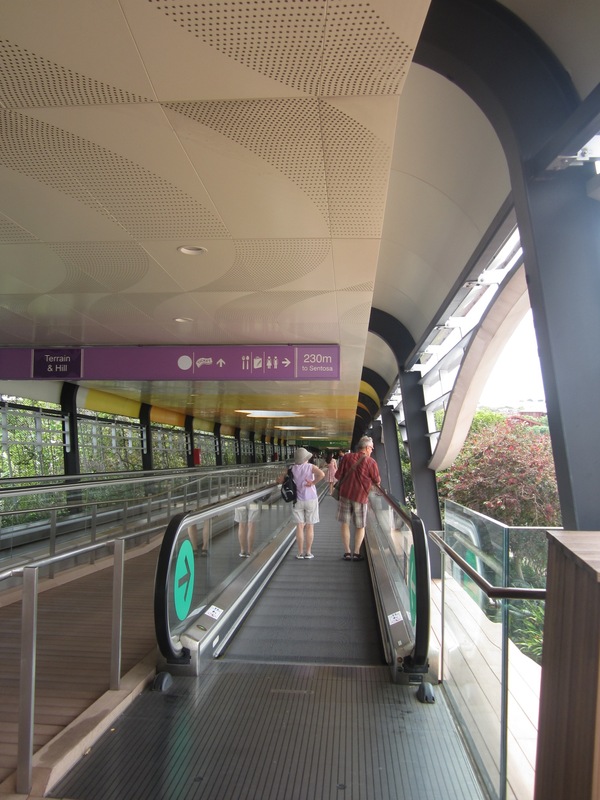 Take the Sentosa Express Train. 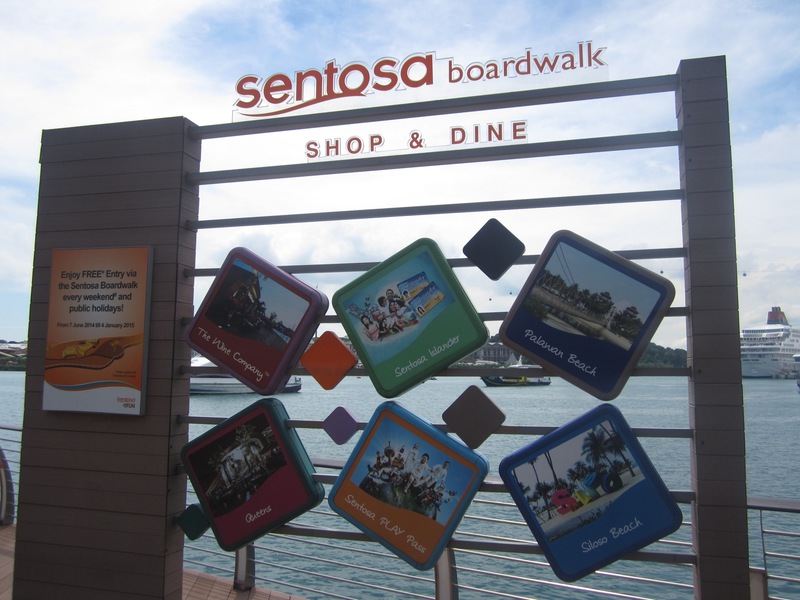 Once you enter Sentosa, there is a small monorail which takes you through Sentosa and its attractions to the beach (only 4 stops). This monorail is always FREE! 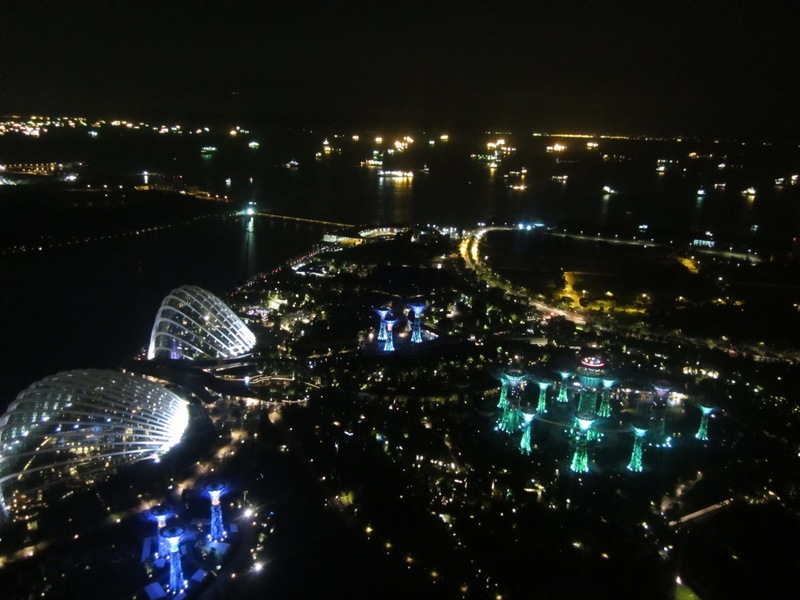 On Sentosa there are many expensive attractions such as Resorts World, Universal Studios, SEAS Aquarium, Madam Tussauds, a waterpark, a zip line and many many restaurants. 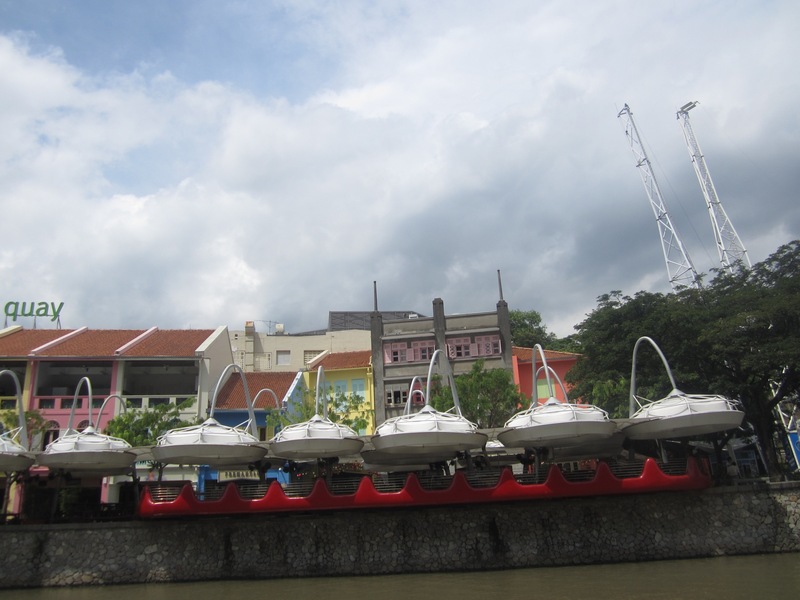 At the same time, you can visit Sentosa nearly for free depending on what you want to see and do. 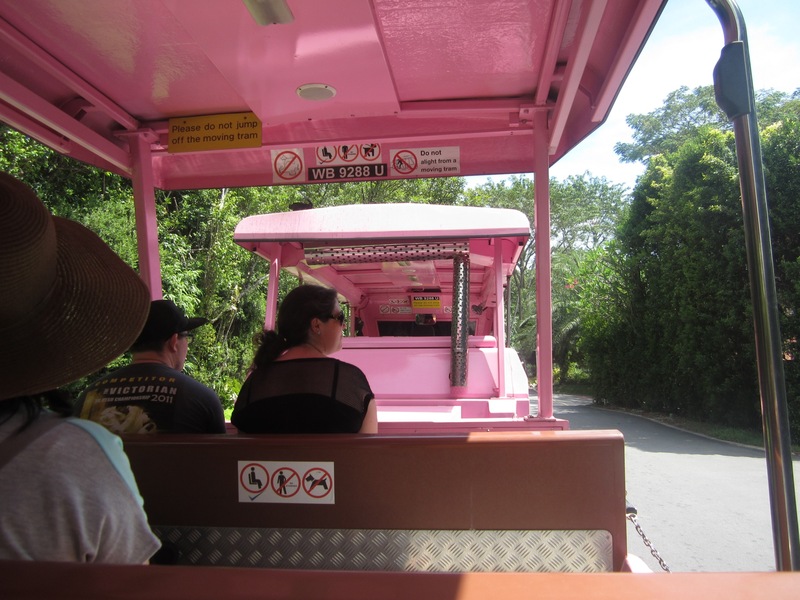 In addition to the free monorail, along the beaches there is a FREE tram which will drive you from one end of the beach to the other making several stops. 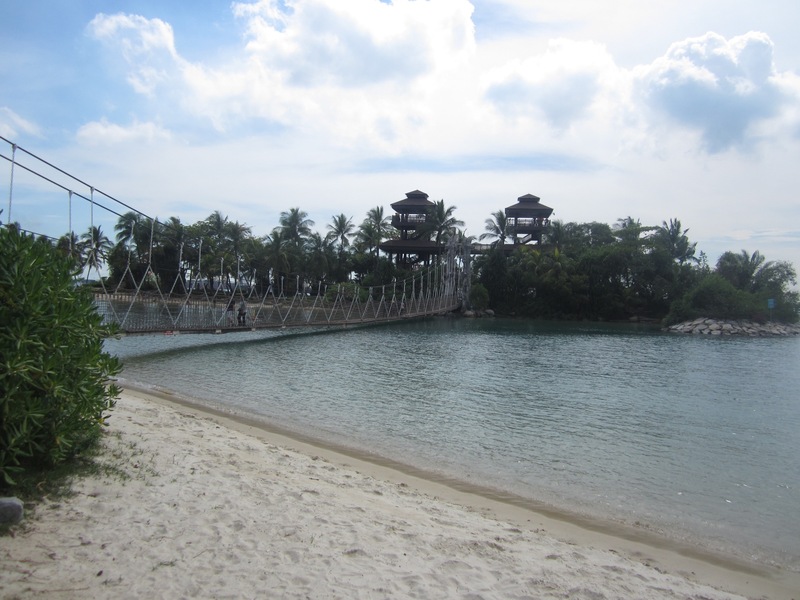 The beaches of Sentosa are also FREE! The beaches are beautiful and clean, so is the water. We went on a Friday so I can’t say how crowded it would be on a weekend but when we went we were practically the only ones on the beach. 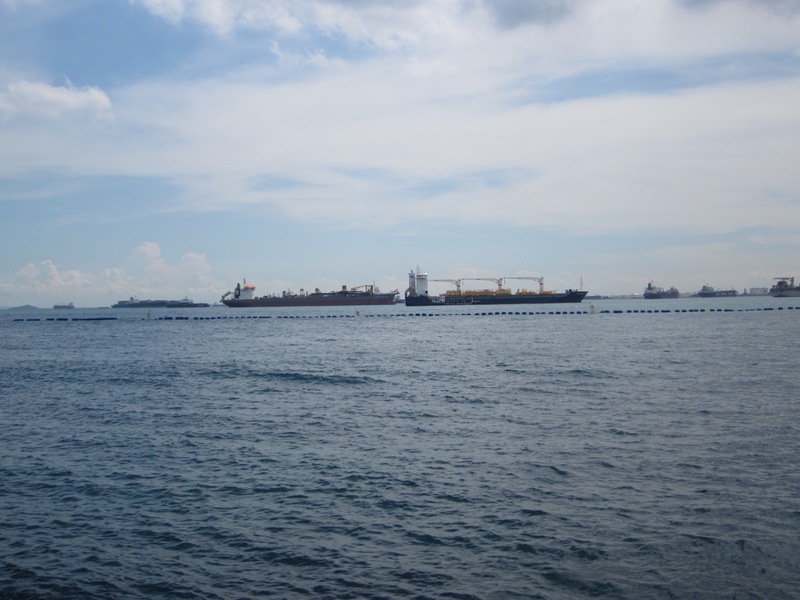 We found it especially impressive that the water was so clean because just beyond the island and barricades is the giant port of Singapore complete with countless ships of all sizes. 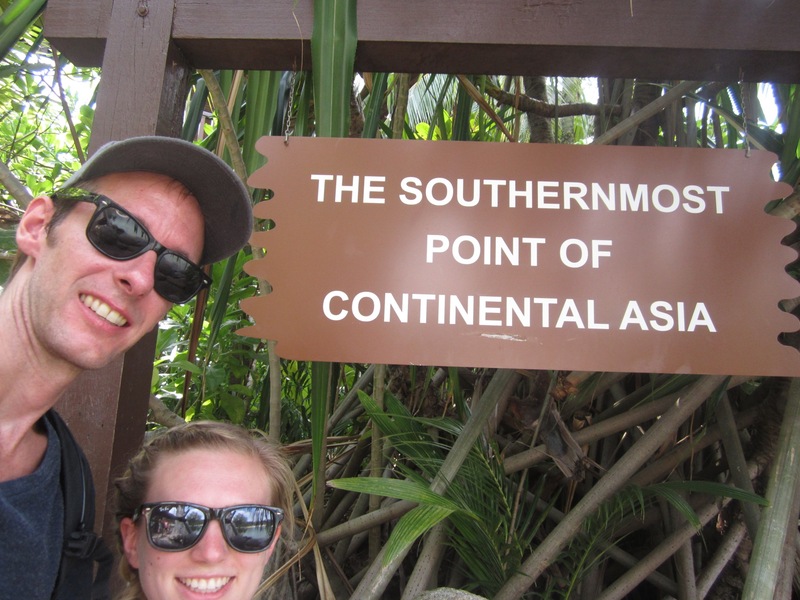 Another fun thing that Sentosa has to offer is the southern most point of continental Asia! 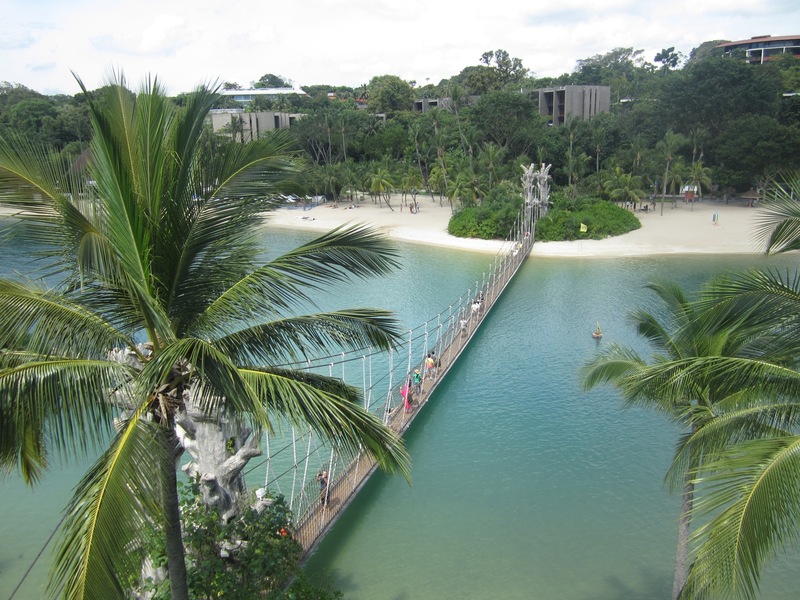 It is just next to the beach across a rope and wood bridge reminiscent of the Swiss Family Robinson to a small island. Definitely worth a few pictures. In the evenings there are two different free shows you can enjoy. 21:00 The Crane Dance – the worlds largest animatronic cranes dance in a show of water light and sound. 21:30 Lake of Dreams – 15 minute water, light and fire show. 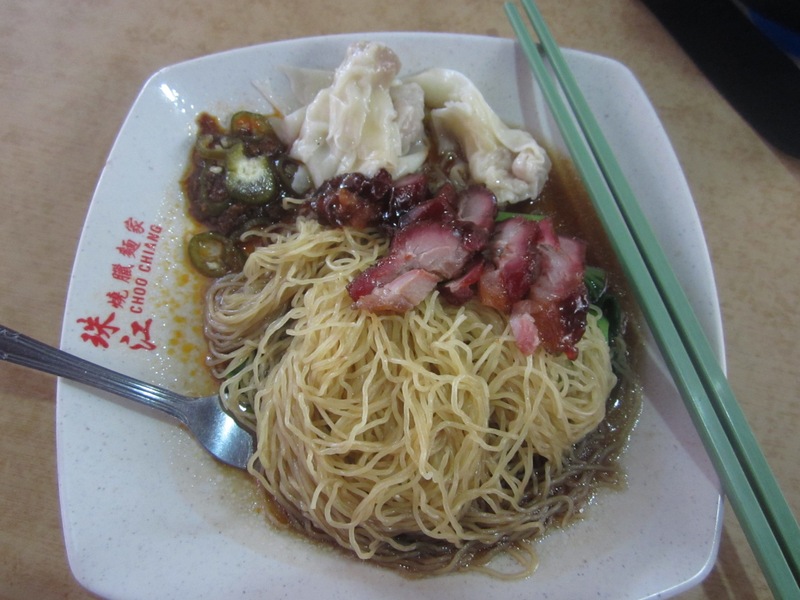 This time around we did not stay that late because we were sun tired from the beach and we really wanted to have dinner in Chinatown but I think if you stay at Sentosa for the evening these shows would be great to see. For dinner we took the metro to Chinatown. 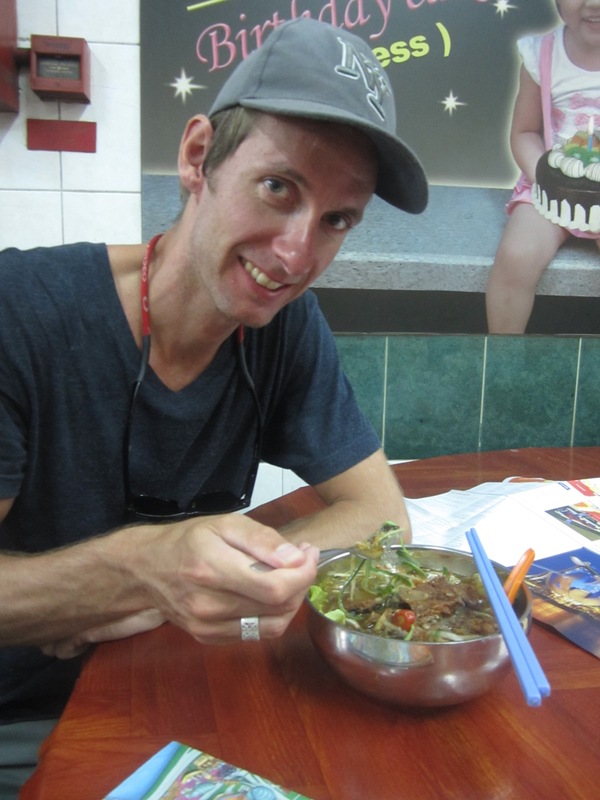 After walking through the main streets of Chinatown we decided to get off the beaten track a bit. Mostly the main streets in chinatown are touristy full of shops selling souvenirs and restaurants that in our opinion were a bit overpriced for what they were. After walking only about 2-3 blocks from the main streets we found a great little restaurant. It was packed! and we were the only tourists there. 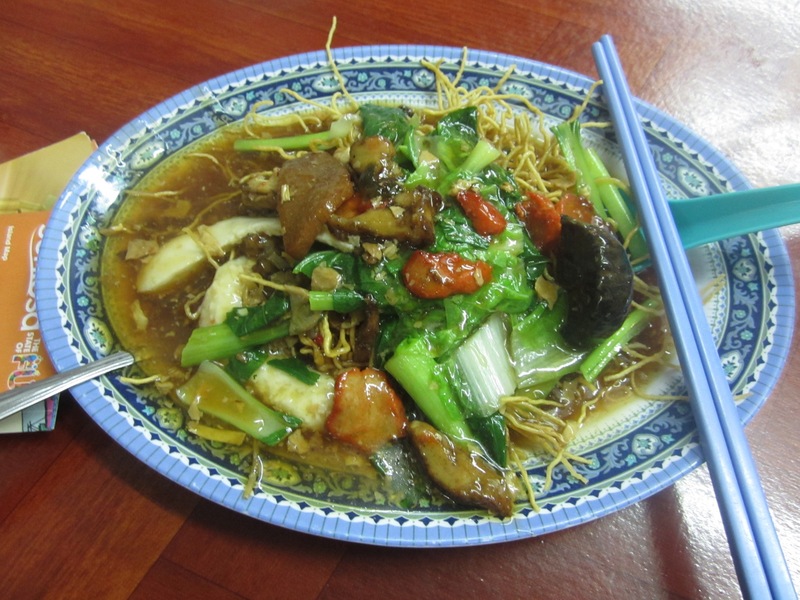 The menu was mainly photos and Chinese characters. 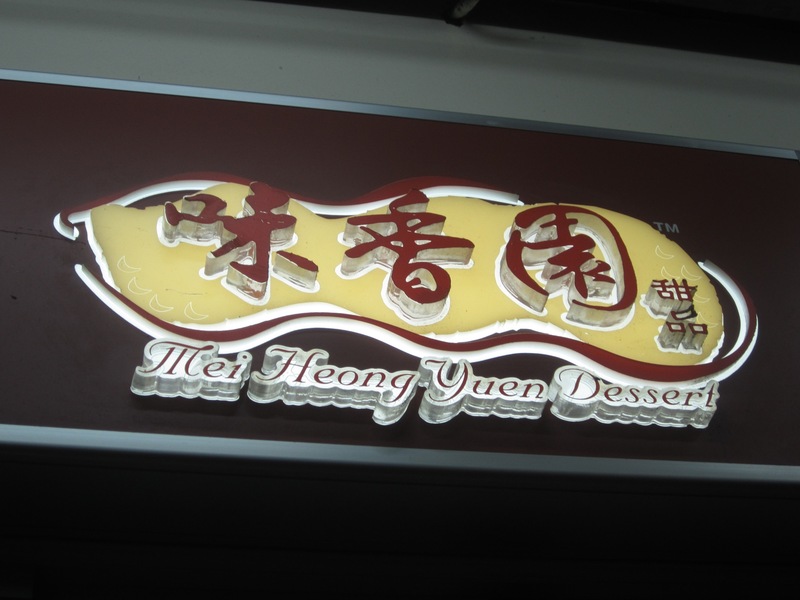 Of course the dish name was in english but that was not always so helpful. We decided to give it a go and just order. It worked out great! We were sharing a table with two locals and we started talking to them a bit. They were curious where we were from and what we were doing in Singapore. After dinner they told us about a dessert place around the corner where they were going next to get something called “Snow Ice” and they highly recommended it to us. Of course local tips are always the best so when we finished our dinner we headed over to find it. 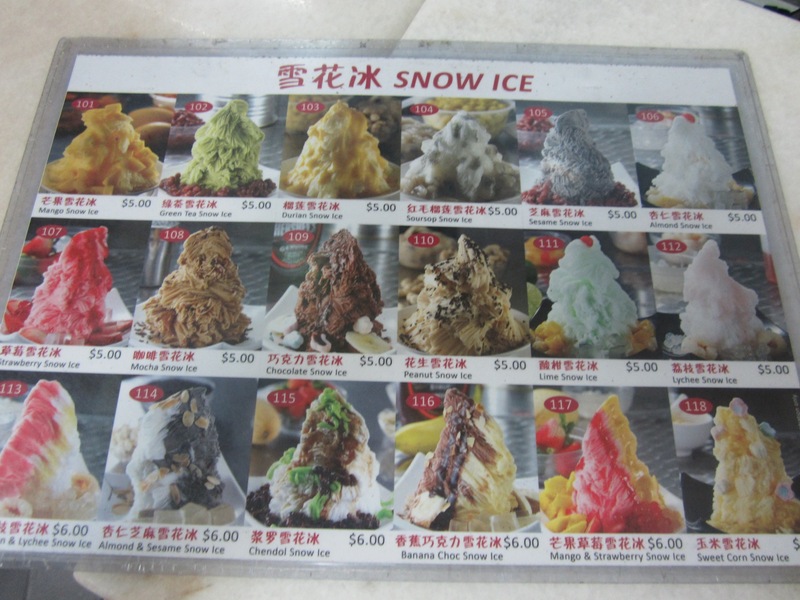 And let me tell you, “Snow Ice” is my new favorite dessert! It is kindof similar to Italian ice or gelato. 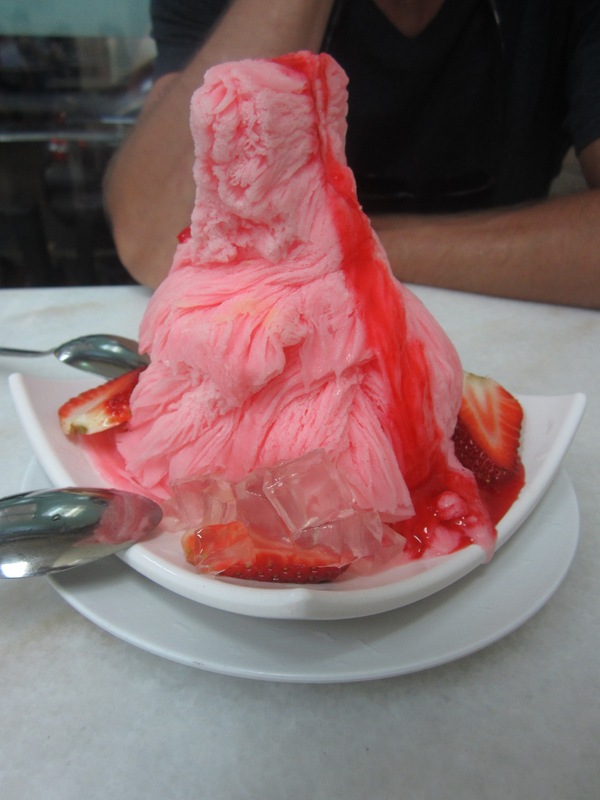 It is basically shaved ice flavored with a syrup but it is so creamy it almost tastes like ice cream and it comes in so many different flavors. 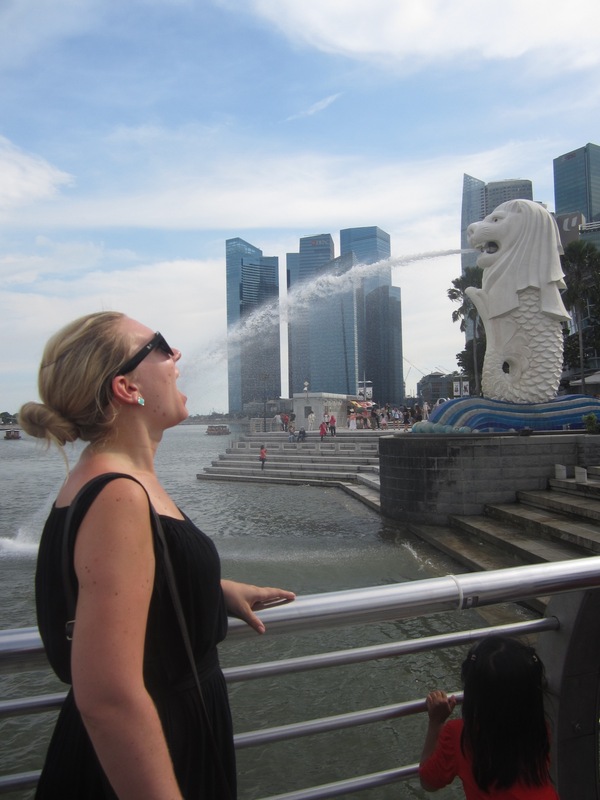 This is a MUST DO if you visit Singapore. 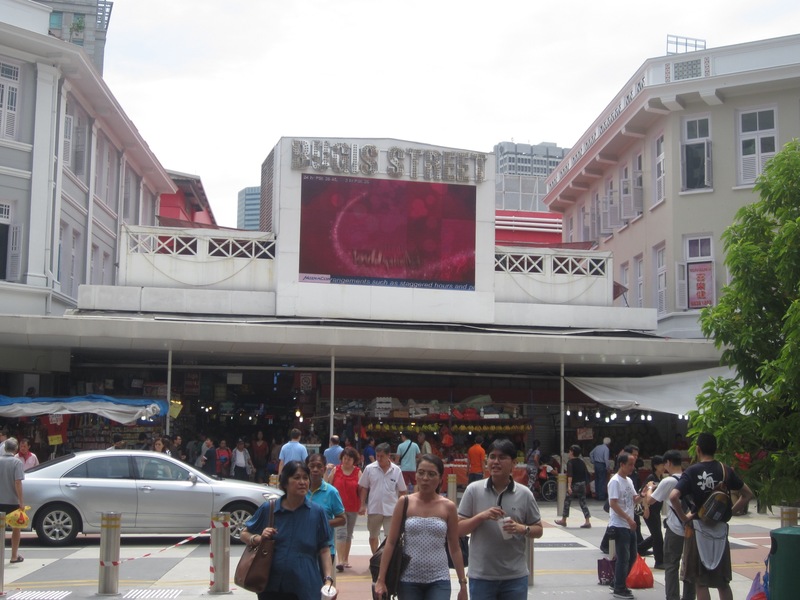 To start our third day we explored Bugis street a bit. Then we headed back to the bay area for a boat ride. 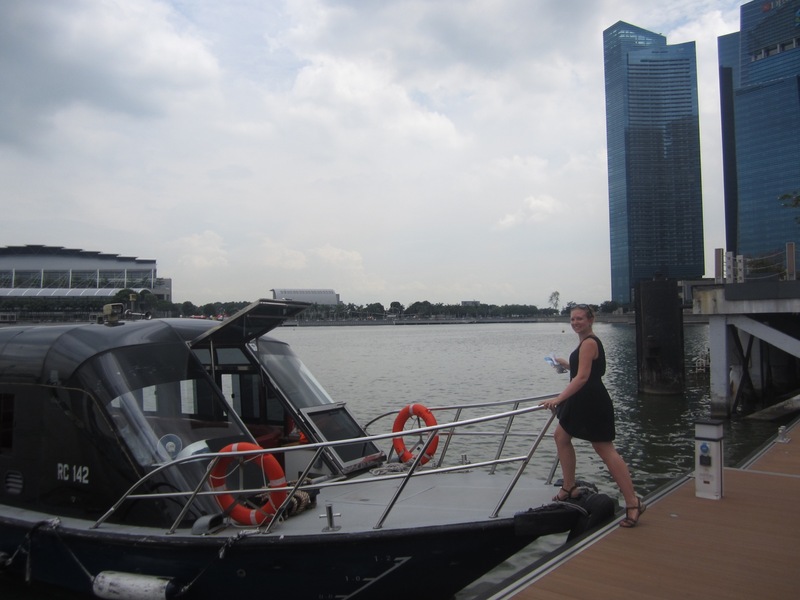 The 3 day tourist metro pass also includes a FREE boat tour of the bay and river with BubbleJet. Again I would say, similar to the Funvee bus tour, this boat was not necessarily worth it if you bought a ticket (it costs $30 pp) but for free it was great! 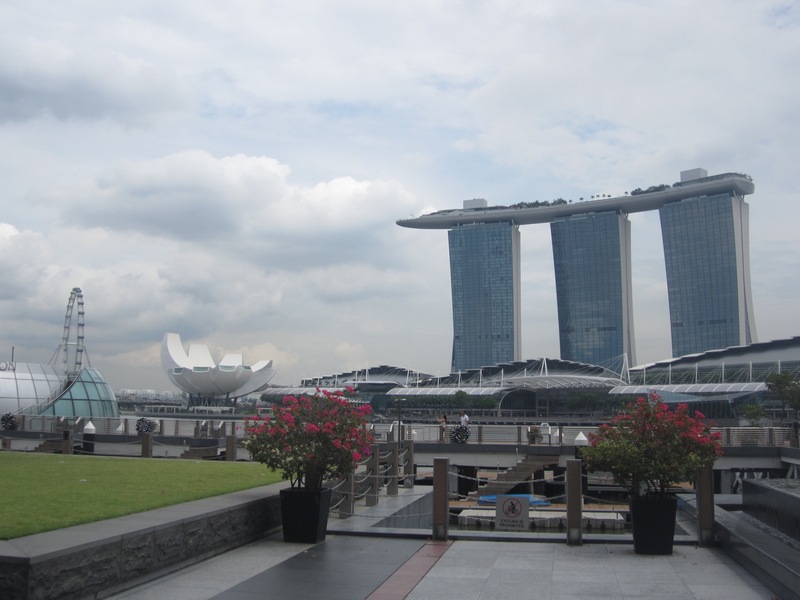 We walked along the boardwalk at Clifford Pier, where you pick up the boat and got some more amazing views of the Marina Bay Sands hotel and the Singapore skyline. 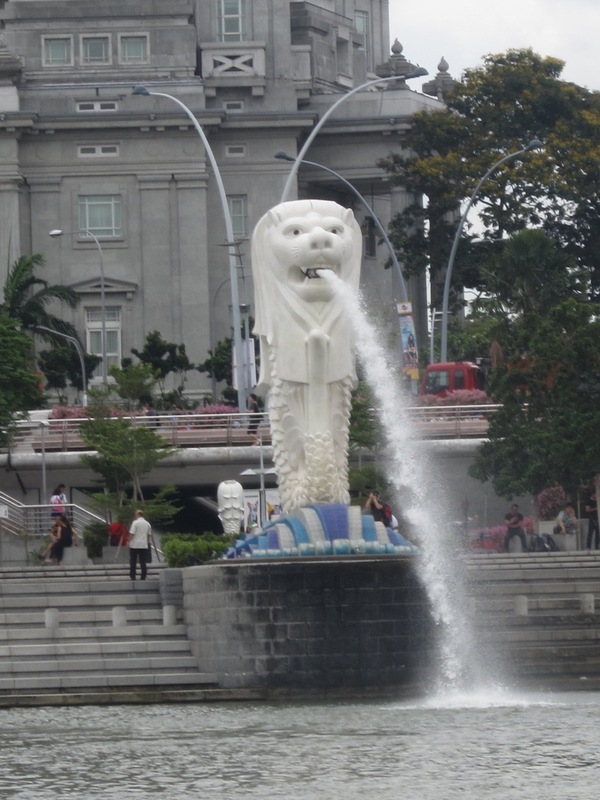 Clifford Pier is also where you will find the statue of the Merlion. 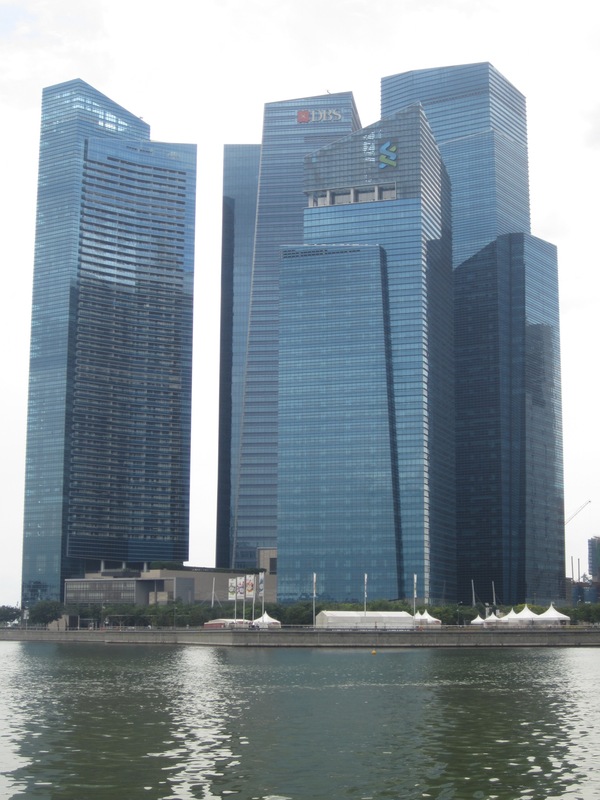 This is now the symbol of Singapore. It has the head of a lion and the tail of a fish/mermaid. It was made up in the 1960s to boast tourism. I don’t know about you but I love it! Then we got on our boat. 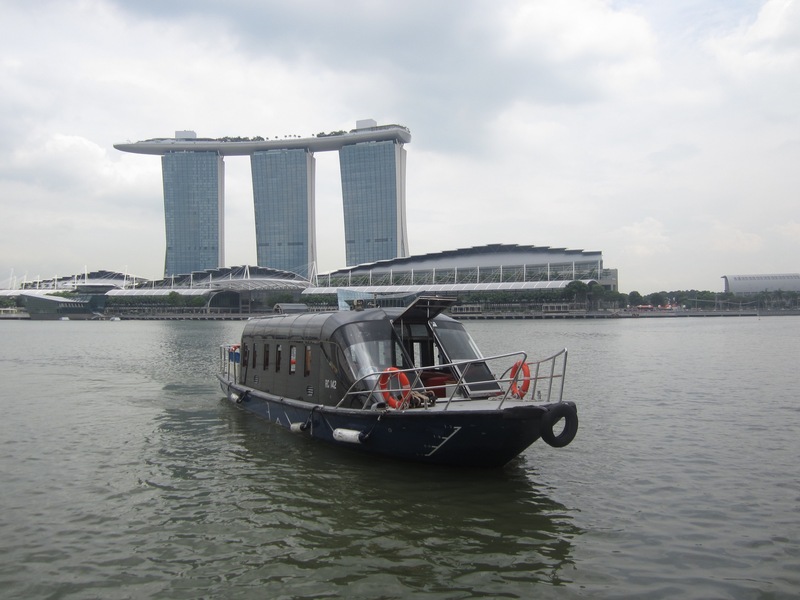 The boat trip is a nice way to see Singapore in another way. 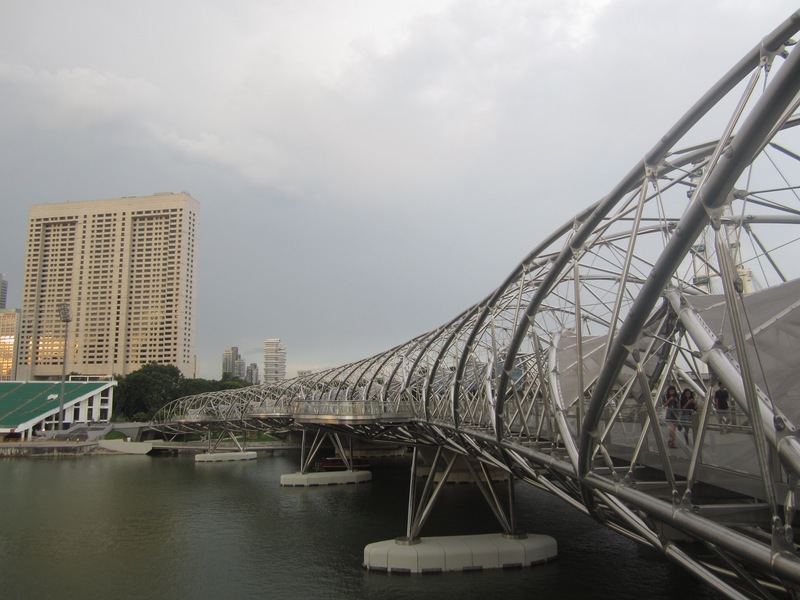 Here are some of the lovely views you will see along the river. 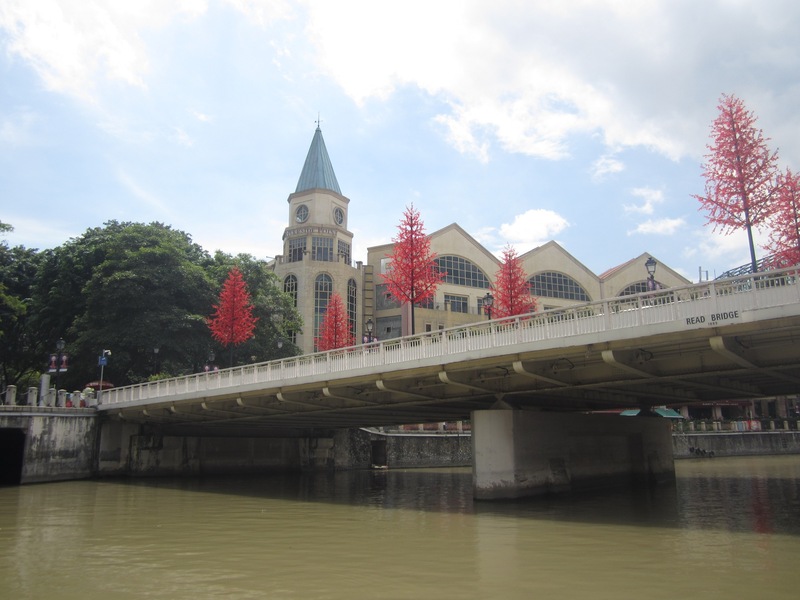 After our boat trip we walked along Clark Quay and the river. All along the river there are great restaurants and cafes so we stops for a beer. 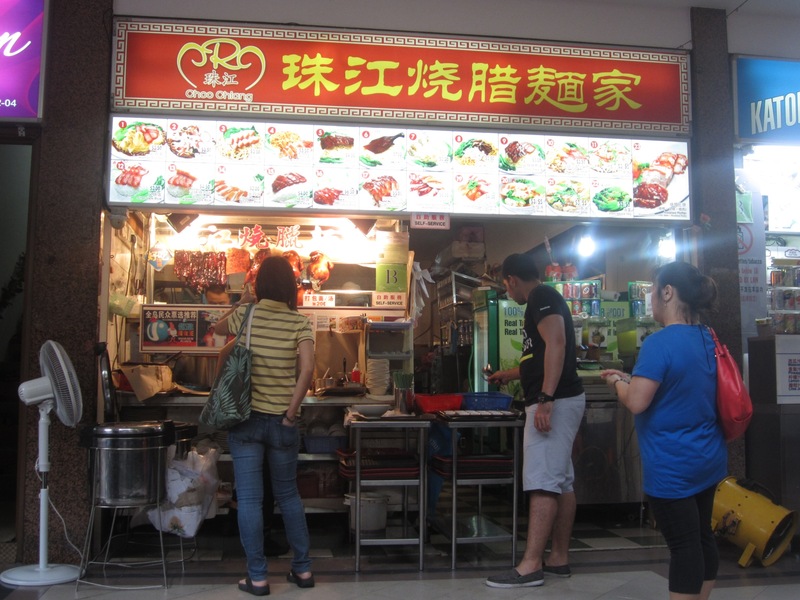 Then we headed back to our hostel and neighborhood to get some dinner and to change for the evening. 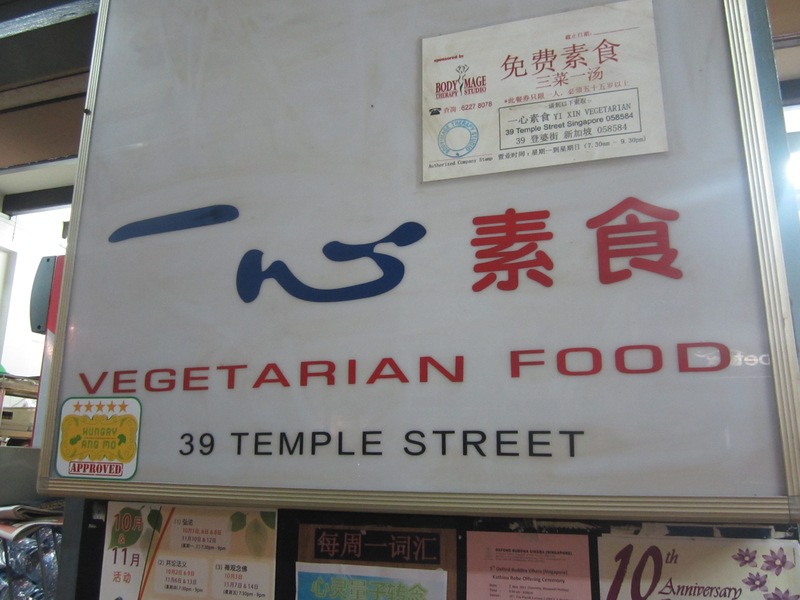 We had dinner at this great little place about 2 blocks from our hostel. 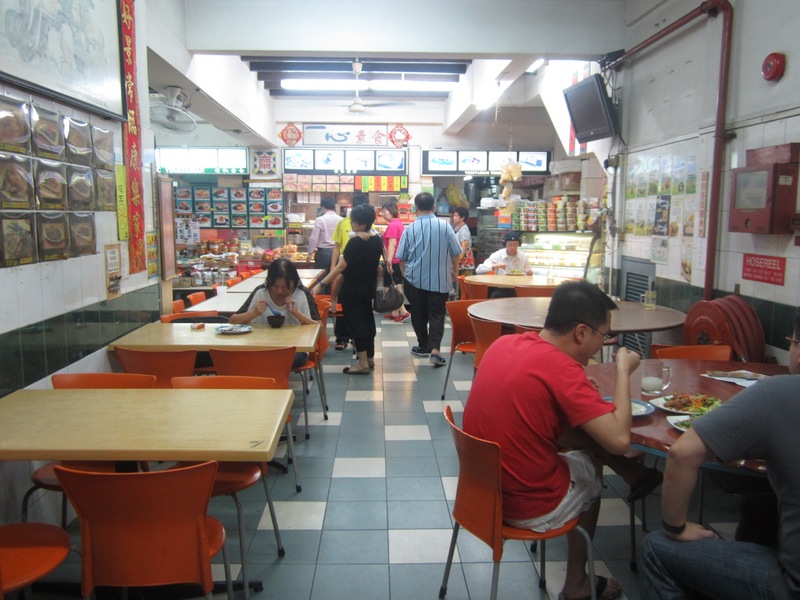 It was small with plastic tables outside but the food was great. 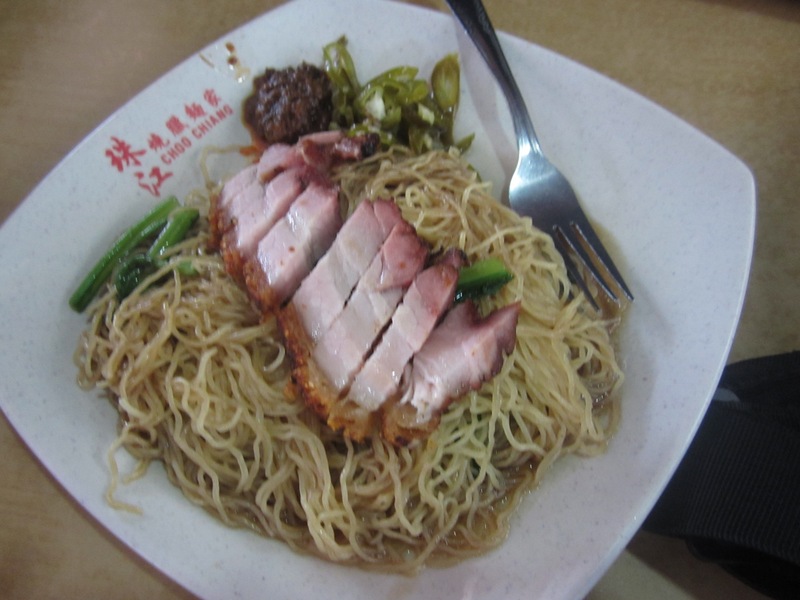 These are the best types of places to eat in Singapore where you get great food and the most bang for your buck. 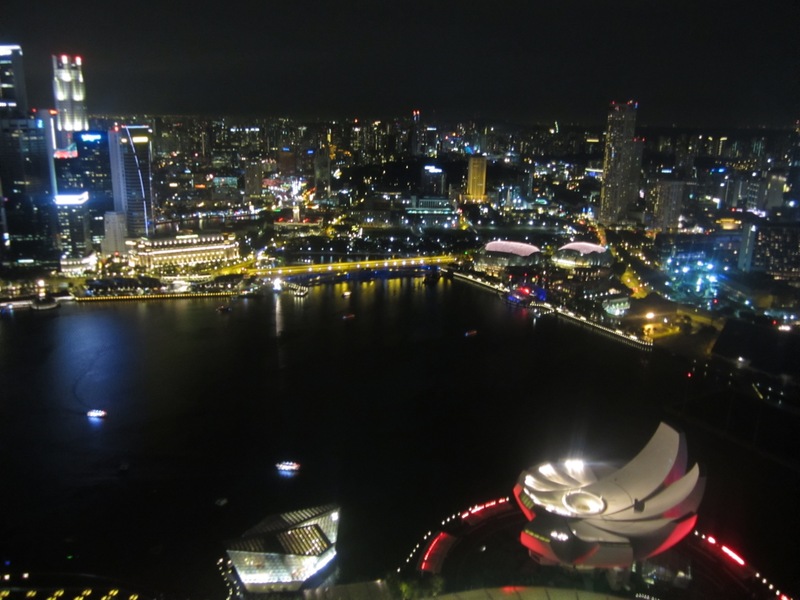 After dinner we went to our hostel to change for our big evening plans: we were heading to the Marina Bay Sands Hotel to have drinks at the bar on the roof. 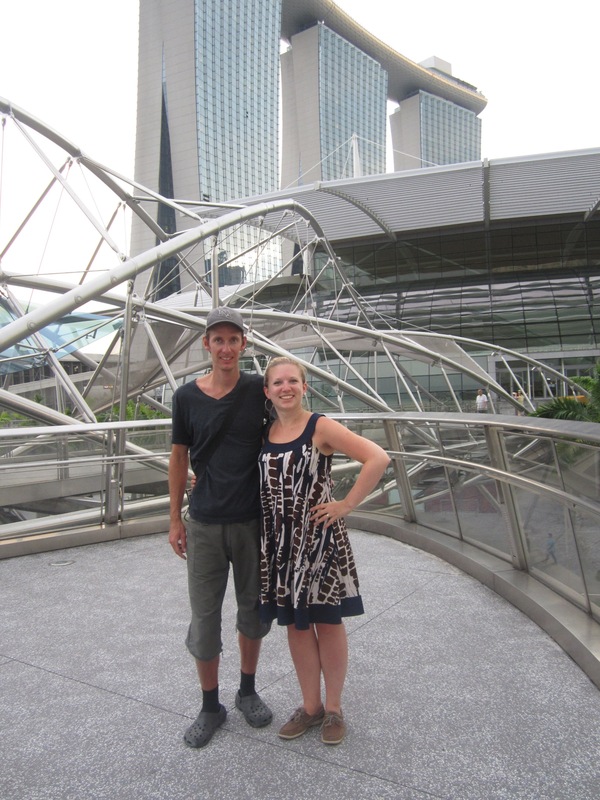 To visit the roof of the Marina Bay Sands you can do a few things. 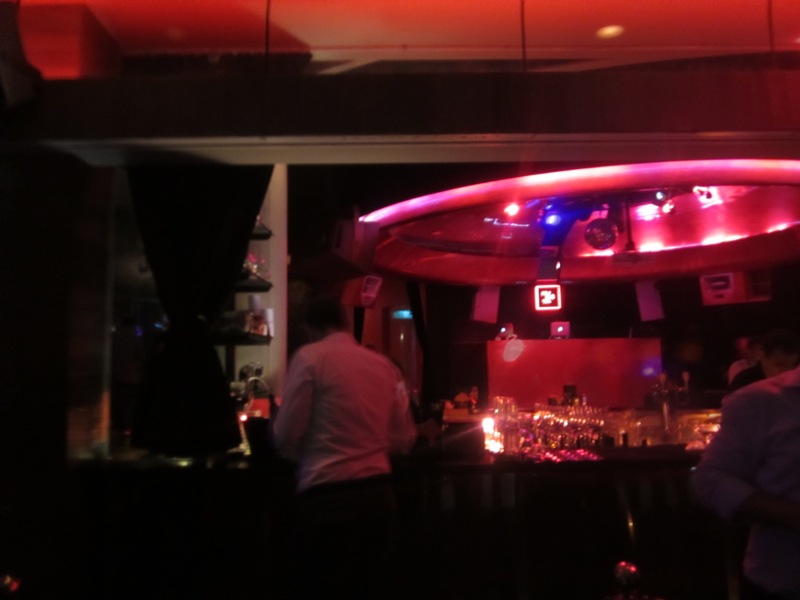 – ClubLounge: this club/bar area has a roof so it remains open regardless of weather. We decided to opt to go up for a drink. 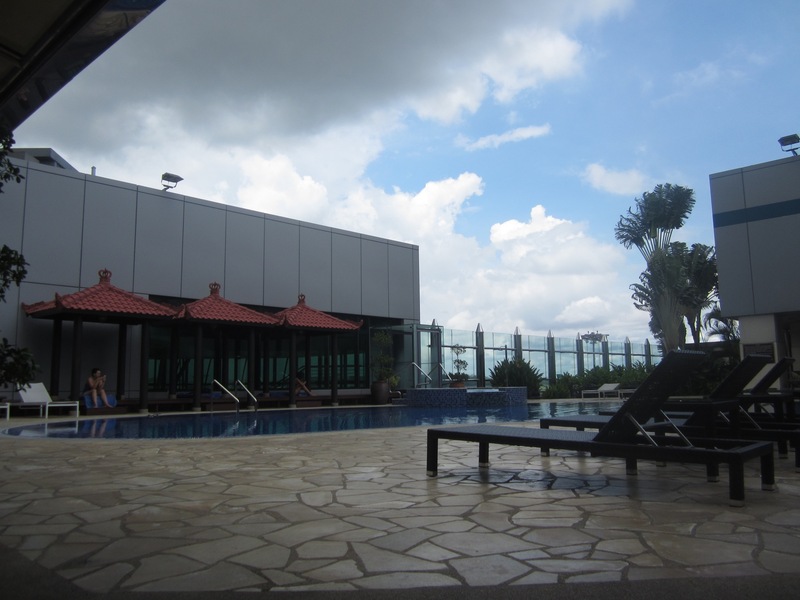 Unfortunately for us (though we worked it out) it was raining a bit when we arrived so they closed the skybar. 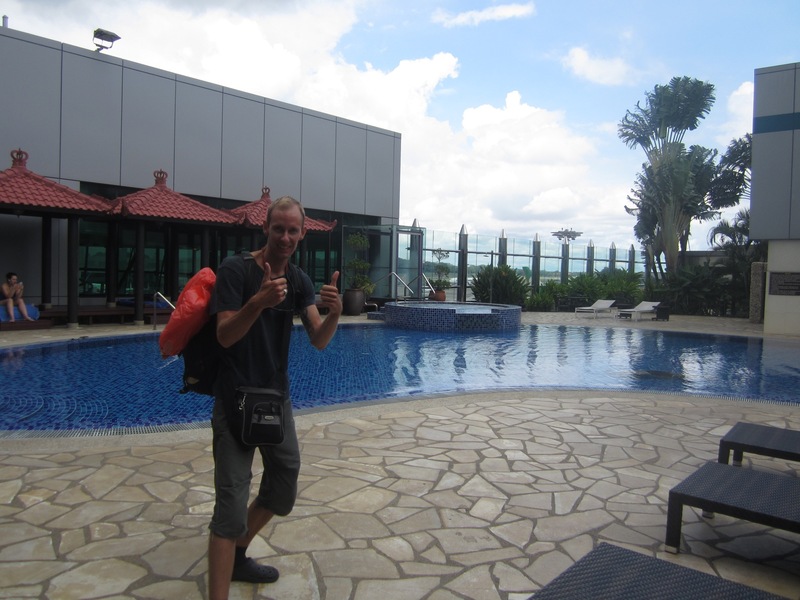 This meant that the Club Lounge was our only option but Glenn could not enter wearing his Crocs (the only shoes he has!). So we went on an adventure. We headed back to Chinatown in search of shoes and amazingly we managed to find a pair and the whole trip took only 1 hour total! Then it was time to head up to the 57th floor for a now much needed drink. 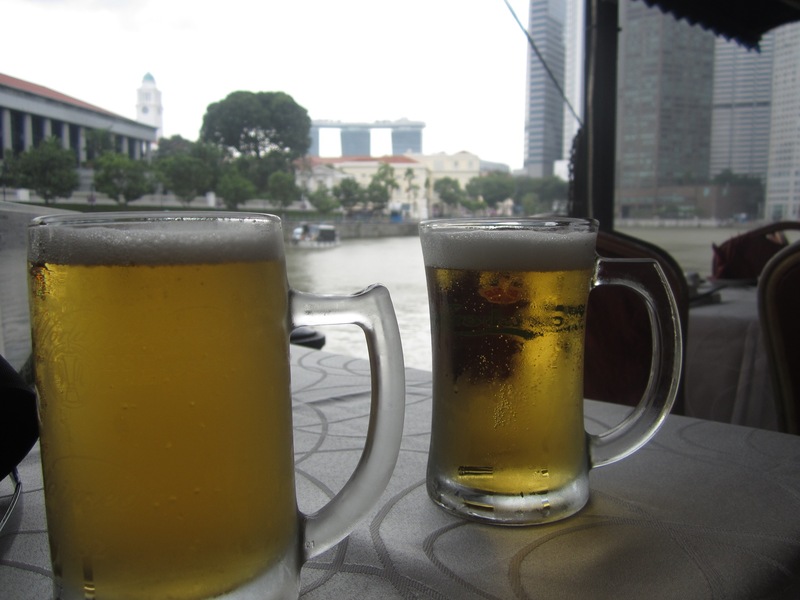 Remember the drinks are NOT cheap (a beer was $20 and the cheapest drink on the menu) but it is the view you are really paying for so it is totally worth it. The views are amazing! 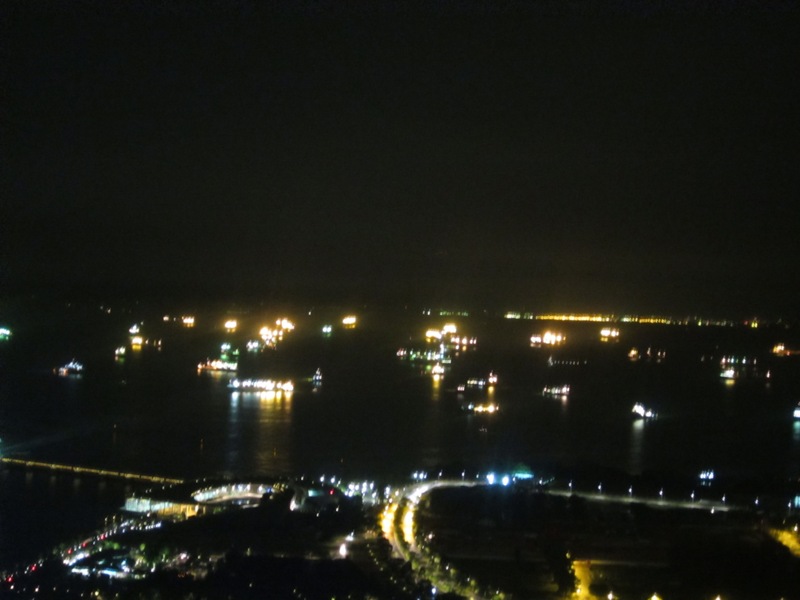 from one side you can see the Gardens by the Bay and all of the ships in port. 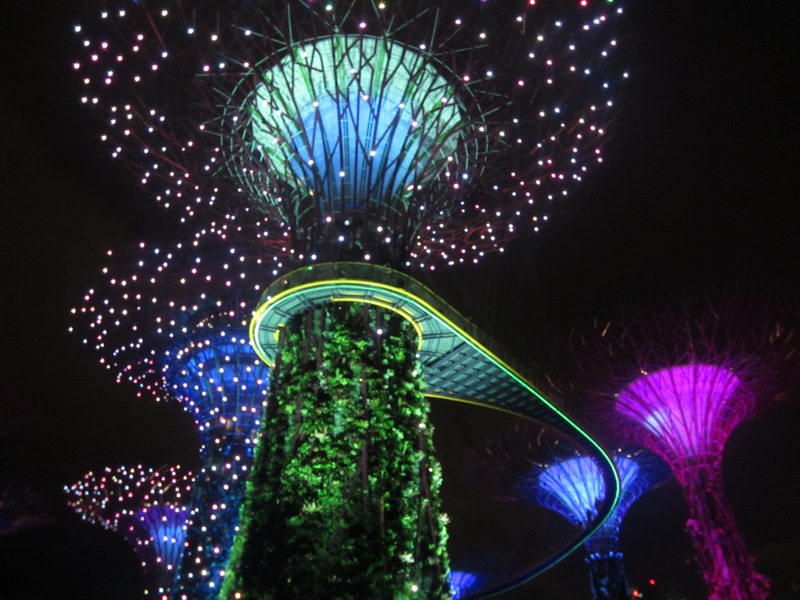 Be sure to remember that at 19:45 and 20:45 there is the SuperTree light show at Gardens by the Bay which you can see from the rooftop. 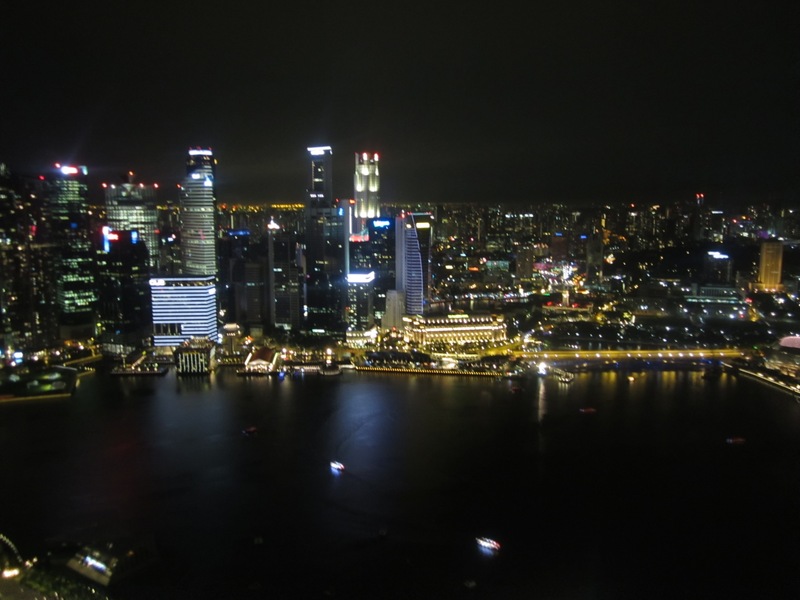 On the other side you can see Singapore Bay and the beautiful skyline. 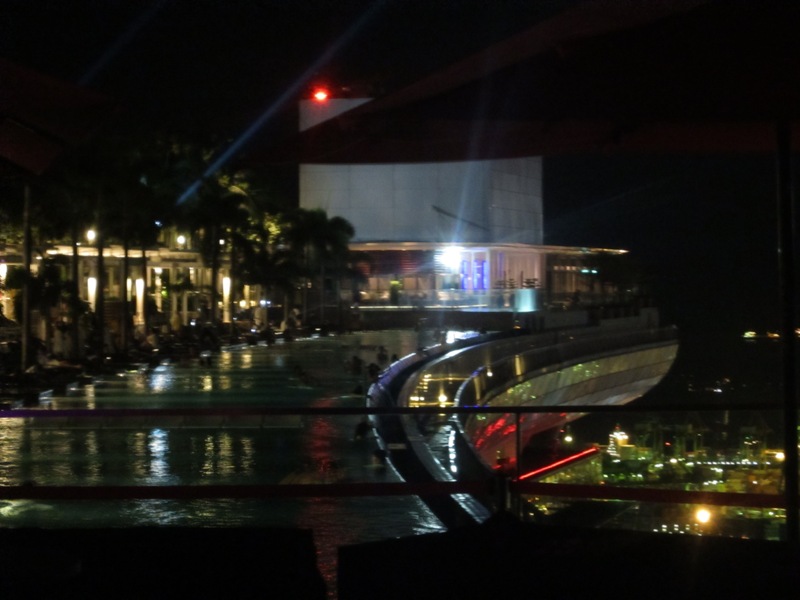 And finally, when you visit the rooftop for a drink you get a glimpse of the famous rooftop infinity pool that made this hotel famous. After seeing it we have decided that we will go back to stay at this hotel someday (despite the $300 per night price tag) because we want the experience of swimming in this pool. The next morning we headed to the airport to continue on our trip. Had we known in advance what an amazing airport it is we might have gone hours earlier! 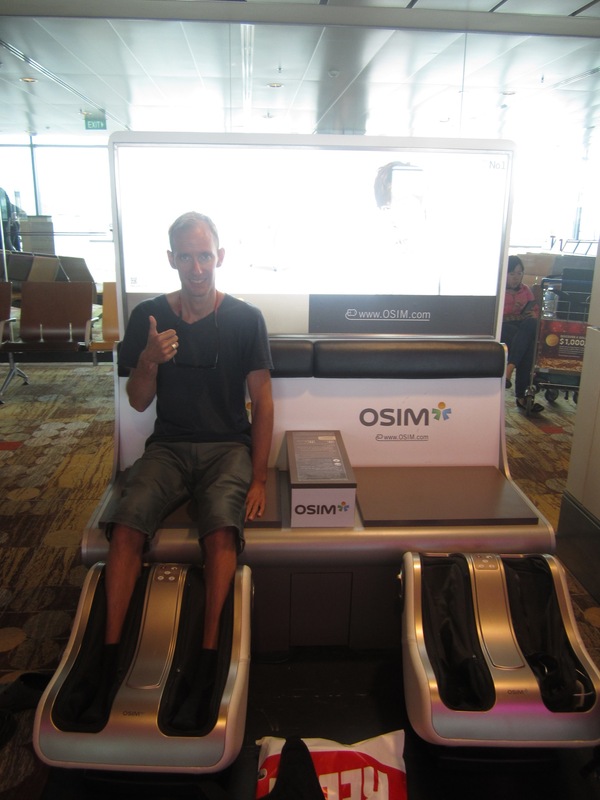 Singapore has an amazing airport and because it is also a large hub is a great choice if you have a long layover. Yes you read that right. 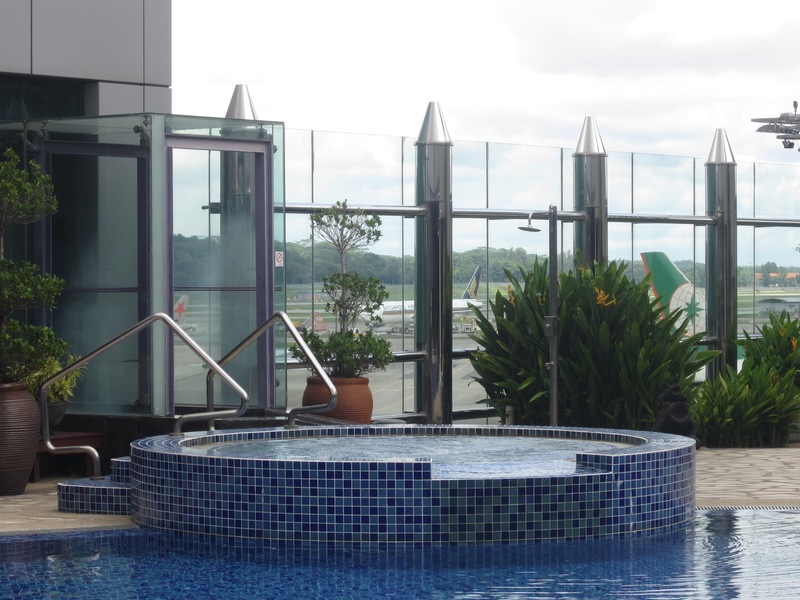 there is a swimming pool at the airport!